The Gazette de Montreal a publié ce bel article vedette d'Union Éclairage dans la section commerce. Few companies from Montreal’s horse-and-buggy days still are part of the city’s commercial landscape. That’s one of the ways 102-year-old Union Lighting stands out. Another is its sprawling showroom at Décarie Blvd. 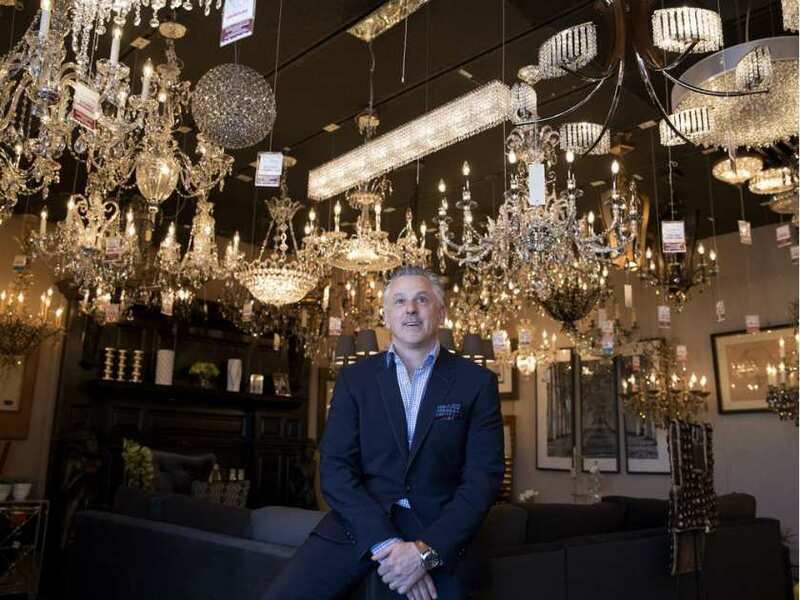 and Royalmount Ave., a maze of galleries featuring everything from lighting fixtures and chandeliers to light bulbs and switches, but also bathtubs, furniture, appliances, blinds, mirrors, locks, fans and decorative items of every style and description. To add to the selection, the store is surrounded by other shops catering to home décor. They’re tenants of Carré Union, the strip mall it owns and anchors. She and partner Anne Hébert moved their design store BAB into the Union Lighting premises two months ago, after operating as a standalone store on nearby Paré St. It wasn’t when it started in 1914. The business was known then as The Star Gas & Electric Co., opened by Romanian immigrant Abe Naimer in a small space on Craig St.
One by one, Naimer’s five brothers — including Bram Naimer’s grandfather, Hyman — immigrated from Romania and joined him in Montreal. When they were all here, in the mid-1920s, the business changed names. His father, Gerald, was from the second generation to operate the business, which evolved quickly to keep up with rapid changes in the lighting industry. The project was not perceived favourably by all the founding families, and two exited from Union at that point. By the late 1980s, Union Lighting had become one of the largest privately-owned, full-line electrical distributors in Canada, with annual sales volume in excess of $250 million. But intense competition made the sector increasingly difficult, and Union Lighting’s braintrust eventually decided on a change in vocation for the company. It downsized and reshaped itself to focus on lighting distribution, leaving the low-margin side of the business to the multi-nationals. Sales today are a fraction of what they were in the 1980s, but the company is sounder and more focused, said Bram, who has worked at Union since his teens and became president three years ago, working alongside brothers Darren, 46, and Clifford, 44, who are vice-presidents. Their branch of the family is now solely in charge of Union after buying out another of the founding families three years ago. The company, which employs 80 people, recently opened offices in Quebec City and Florida and soon will have an e-commerce site. “Looking ahead, we want to build our corporate/commercial department and cover more of the U.S. and Canada in retail,” Bram said. The wholesale division, tailored for contractors, architects, property managers and designers and focused on residential, commercial and industrial clients, currently accounts for almost 70 per cent of total sales. Recent projects included Sports Experts stores from coast to coast, the new McGill University Health Centre hospital and the Centre Vidéotron arena in Quebec City.